Week of November 17, 2017 | 1-2-3 SPORTS! What About The Great Ones? Over the past month I’ve written about a 3-part series on spread of club sports in Minnesota: its impact on the young athletes, their parents (their parents’ checkbook), high school sports, and even the health-related issues popping up at younger and younger ages as a result of repetitive use. My question throughout the series was “What is the point of youth sports?”. After reading and writing about the series, I suggested we cannot measure the success of a youth sport system by only looking to how good the best athletes become. Youth sports has to be about more than how far the best go, it has to avoid a participation equals success mentality, and we can’t lose a sense of a community – one defined by geographical proximity – in the process. Not the easiest recipe to perfect. During that same period of time, the U.S. Men’s National Team was struggling with its own recipe. The team failed to qualify for the 2018 World Cup. Missing out on the once-every-four-year tournament was a big failure for many reasons, and a lot of people are now trying to figure out what went wrong. The coach resigned, and a new president of U.S. Soccer is likely to be elected in February. But all of this matters less to me than having wait another four years the opportunity to see Christian Pulisic represent the U.S.A. in a World Cup. TOB wrote a spirited summary of the loss and the cost of the U.S. not qualifying, and the the missed opportunity for us to see Pulisic. BTW, I think this might be the first time we’ve quoted the other guy’s story in a post. The team has been graced with the Christian Pulisic, who is starting for a top tier team in the Bundesliga, and who, at age 19, pretty much no one disputes is the greatest American soccer player of all time. Pulisic has the vision, touch, and creativity that separates the great soccer players from across the world from the pretty good ones that the U.S. has produced in the past. So I was writing about youth sports culture, and TOB wrote about the cost of the USMNT missing the World Cup, which is why I want to share this story Pulisic contributed to The Players’ Tribune. Here’s his experience of not only the failure to qualify, but also his take on youth soccer in the U.S. and his experience in the highest levels of club sports: academies. In the U.S. system, too often the best player on an under-17 team will be treated like a “star” — not having to work for the ball, being the focus of the offense at all times, etc. — at a time when they should be having to fight tooth and nail for their spot. In Europe, on the other hand, the average level of ability around you is just so much higher. It’s a pool of players where everyone has been “the best player,” and everyone is fighting for a spot — truly week in and week out. Which makes the intensity and humility that you need to bring to the field every day — both from a mental and physical perspective — just unlike anything that you can really experience in U.S. developmental soccer. Without those experiences, there’s simply no way that I would be at anywhere close to the level that I am today. It makes sense. For the best to reach their potential, they need to compete. They can’t always be special, and they need to learn how to respond to challenges and pressure. I guess I want it both ways, right? I want youth sports to be the beacon of a community, but of course I want to cheer the absolute best of the best to bring home big wins, especially for the ol’ U.S.A. By all accounts, the club methodology is the right way to develop the skills of the most talented, but I don’t want to give up the quaint, neighborhood aspects of youth sports. I think there are degrees to club sports. I understand the highest order of them – the academies and the like in the soccer world – but I wonder if a lot of the stateside club teams are profiting off of the youth academy model, rebranding them with gratifying names like “Perfect Game”, “Super Select”, and tacking on a hefty price tag. So, yes, there should be room for both, but I wonder how broad the spectrum needs to be to account for us regulars and the Pulisics of the world. Put in another way, a virtuoso violin player shouldn’t play with the high school symphony. A 12-year old with an exceptional math mind shouldn’t be sitting in Algebra to fulfill a sense of community. Their respective talent cannot be developed in that environment, and their contribution to community pride is to show what’s possible. The 2018 Winter Olympics will not feature NHL talent for the first time since 1994. This stinks. I always want to see the best of each country, and while the ‘Miracle On Ice’ was possible in part due to no ‘professional’ players participating, the Iron Curtain created an environment where professional talent was indeed on display for the Soviets. Apples to oranges when compared with the 2018 and the NHL withholding its players from the games. Quick tangent – don’t you think the NHL would love to put its players on an international stage? Wouldn’t the league benefit from that kind of promotion? Ditch the All-Star Game, take a 3-week break in the middle of the season, and let the studs play. I don’t know the inner-workings behind this decision, but on the surface it seems shortsighted. 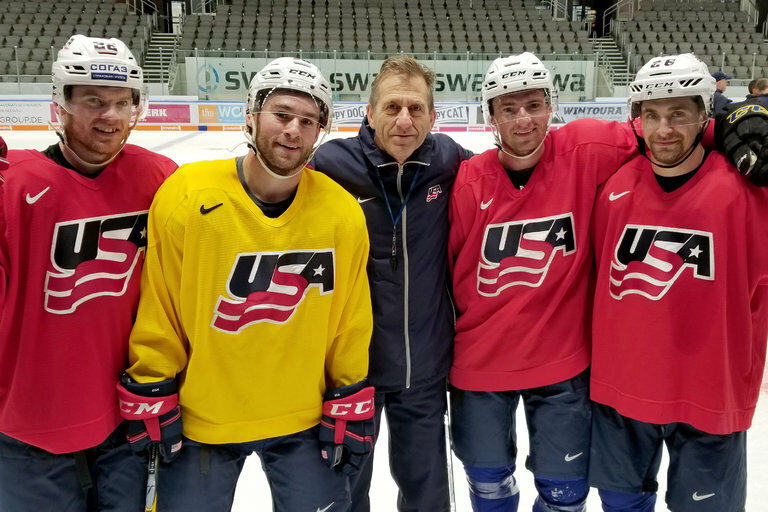 All of this creates a pretty cool opportunity for some guys who’s hockey dreams were seemingly behind them, including four former college teammates at Yale – Mark Arcobello, Sean Backman, Broc Little and Brian O’Neill. [They] have chased hockey careers in Finland, Germany and Switzerland. Together, they exemplified the traits of the American group that found its way to Augsburg: Those who let their N.H.L. dreams fade, who pursued the game wherever else they could, who now have an opportunity to add one spectacular highlight to their careers. The team, for which the roster is not yet set, is off to a rough start: 0-3 so far, but these guys are thinking about the bigger picture, and put it in perfectly hockey terms. There was a time when the only people who texted you were people you wanted texted you. Girls.